Here are five pencil accessories. Purchased from JetPens, they are all inexpensive products aimed at children. Four are from Sun-Star, and one from Tombow. I can’t avoid noting that the plastic starts looking less pristine almost immediately after first contact with graphite. Next, a pencil cap which can theoretically become an extender. It looks okay, but I’m not sold on the value. The Tombow Ippo grip. It has a mushy rubbery surface that I don’t like. This will obviously be a matter of personal preference. I can see it being an aid for anyone, young or old, who is seeking assistance in gripping a pencil. The “Safety Pencil Knife”. Essentially, a retractable paring knife for pencils. Of the bunch, this one is the winner for me – it allows for freehand sharp blade use on pencils, in a safe and portable format. That doesn’t mean it is easy to use – but it works, and is a lot easier and safer to transport than an X-Acto knife. The Sun-Star multisharpener is another take on a familiar theme. It works well enough. Overall, I think the safety knife product is pretty good, and the grip may be quite helpful to some. The other three products are fine given their prices, but aren’t standouts. A few ambitious handheld sharpeners attempt to offer multiple options. The wooden sharpener is quite different – it is aimed at five different diameters of pencils, rather than five variations. I wasn’t sure where this was leading, and thought I might be chewing up a lot of pencils in these tests, so I bought a budget pack of pencils: the Dixon Economiser. What I’ll say about these pencils is that friends shouldn’t let friends use the Dixon Economiser! Rough basswood (though not the worst) with rich unpleasant chemical paint aromas, it is no ambassador for pencildom. Note how nicely the K’ZOOL creates those obtuse points. Various readers have asked how to get this type of point rather than a long acute point. The K’ZOOL can do it! For a full review (in German) of the T’GAAL, with quality pencils tested and some great photographs, please see Lexikaliker. My thanks to isu from the uncomfortable chair for the Kutsuwa sharpeners. And regarding the V-15 Dizi: The five holes are 5mm, 7mm, 9mm, 11mm, and 13mm in diameter. Here is a ForestChoice in the 9mm hole. It does not sharpen to a point (or even close), though the 9mm hole would seem to be the best fit for a standard woodcase pencil. New pencil accessories aren’t introduced too often, so I was quite intrigued to learn about the Gripsharp. It resembles one of those rubber ‘ergonomic’ grips that some people prefer for gripping thin writing instruments. You put the pencil in, start sharpening, and leave the Gripsharp in place. Put another way, you sharpen away the wood, leaving the exposed pencil core protruding from the device. Unusual as it is, I’m wondering – what is it for? What is the problem it solves? Would you buy one? What do you think of it? I’d like to thank Gripsharp for sending this sample to me. Does anyone remember the Dixon Oriole? The official product page calls them a “first-rate commercial grade woodcase pencil offered at an economical price”. Well I ordered them online after finding a store that had some older US made stock. Or so I thought. I should have known what was coming – the photo and description were out of date, and I was sent newer Chinese made Orioles. 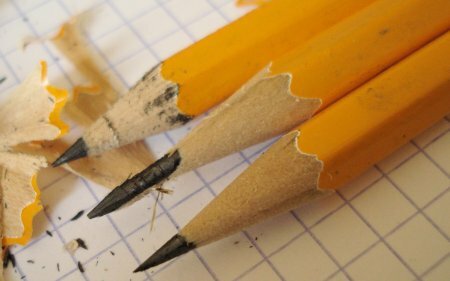 Unfortunately, the pencils seem quite third rate to me – the lead is very scratchy and rough, and the paint finish on some has ridges of bubbles which go beyond being a cosmetic problem – they make the pencil uncomfortable to grip. I do like the font. Am I being harsh? Perhaps they aren’t meant for writing. They are certainly fine for rough marking purposes. So about the sharpener. 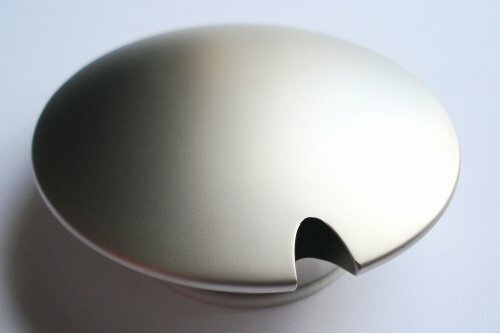 From Möbius + Ruppert we have a three hole sharpener in unfinished aluminum. Each opening has a different length blade. What is this sharpener for? Take a look at this post at the Bundoki Stationery blog. I’m obviously not the only person amused or confused. Does anyone know the story behind this sharpener? Okay, that’s not the real name. But this pencil sharpener did communicate an enthusiastic futuristic sensibility to me. Or at minimum, a recollection of the brilliant and sublime villain in Stanley Kubrick’s classic 2001, A Space Odyssey. 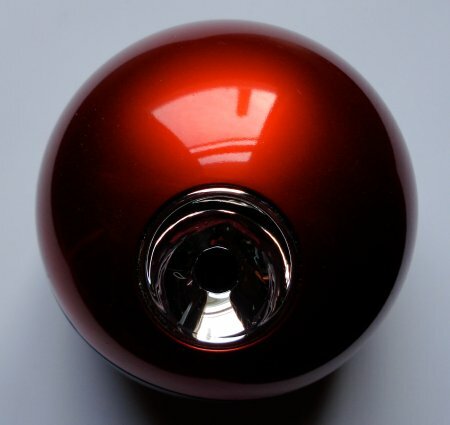 This reflective red orb is quite interesting by itself – even before knowing what it is. Being able to sharpen pencils is an extra feature. 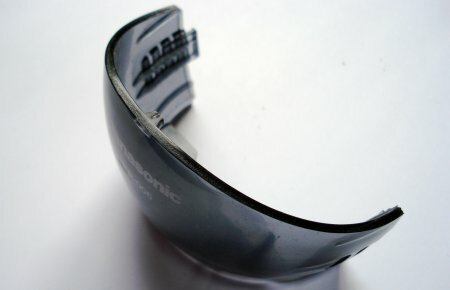 Made by Panasonic, this is the PinPoint KP-006A/B. It is a battery operated pencil sharpener, made in Thailand. Purchased by mail order, the shipping and battery (4 AAs, not included) cost was greater than that of the sharpener itself. 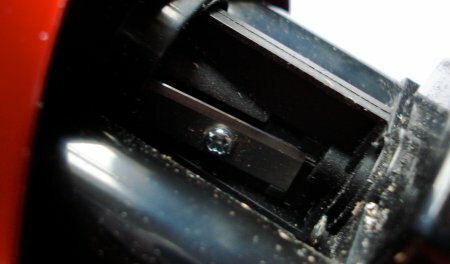 Opening it up revealed a disappointment – it seems to be, in essence, a cheap plastic sharpener, rotated around by battery power. The problem is – the blade will soon become dull. What then? I have no idea where the correct replacement blade could be found – it may or may not be a “standard” size – and even then, it looks to me like some fairly good small part manipulation skills would be needed to make the exchange. I hate the idea that this sharpener, which has many merits, is in some sense “disposable”. The operation is extremely simple. Put the pencil in – and it sharpens. 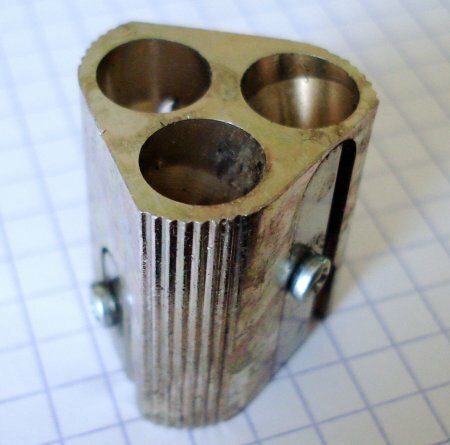 For someone with hand motor problems, or a need to sharpen many pencils, it seems like a very good solution. The only operational downfall is that there is no stop mechanism – it will keep sharpening the entire pencil if you let it! Shavings accumulate in a removable plastic drawer. It may slightly mark up the pencil’s finish. Overall, my feelings are mixed. The PinPoint seems like a great implementation in terms of design and user interface. Yet – we know that blades dull, especially with tough basswood pencils. I’ll try and report back sometime in the future about how it fares over time.